Computational Modelling of Biomechanics and Biotribology in the Musculoskeletal System reviews how a wide range of materials are modelled and how this modelling is applied. Computational modelling is increasingly important in the design and manufacture of biomedical materials, as it makes it possible to predict certain implant-tissue reactions, degradation, and wear, and allows more accurate tailoring of materials' properties for the in vivo environment. Part I introduces generic modelling of biomechanics and biotribology with a chapter on the fundamentals of computational modelling of biomechanics in the musculoskeletal system, and a further chapter on finite element modelling in the musculoskeletal system. 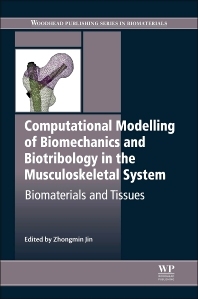 Chapters in Part II focus on computational modelling of musculoskeletal cells and tissues, including cell mechanics, soft tissues and ligaments, muscle biomechanics, articular cartilage, bone and bone remodelling, and fracture processes in bones. Part III highlights computational modelling of orthopedic biomaterials and interfaces, including fatigue of bone cement, fracture processes in orthopedic implants, and cementless cup fixation in total hip arthroplasty (THA). Finally, chapters in Part IV discuss applications of computational modelling for joint replacements and tissue scaffolds, specifically hip implants, knee implants, and spinal implants; and computer aided design and finite element modelling of bone tissue scaffolds. This book is a comprehensive resource for professionals in the biomedical market, materials scientists and mechanical engineers, and those in academia. Computational modelling of biomechanics and biotribology in the musculoskeletal system is a comprehensive resource for professionals in the biomedical market, materials scientists and mechanical engineers, and those in academia. Zhongmin Jin is a Professor of Computational Bioengineering at the Institute of Medical and Biological Engineering, University of Leeds, UK.